I made the antenna 142 feet long. Use tiewraps at each of the three points to form a small loop at each end so that A 3/16″ rope could be used to support the antenna. I used a center insulator (Budwig HQ-1) that I had left over from an old dipole. 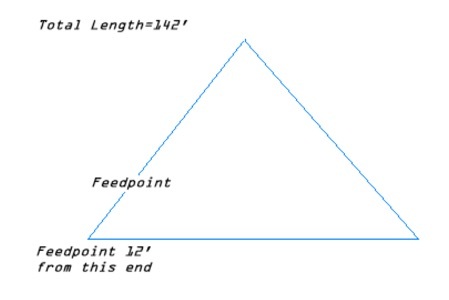 The feed point was 12′ from the bottom of one leg. This antenna requires a matching element of feedline made out RG-59 (75ohm) coax. The formula or the length is a 1/4 wavelength at the operating frequency times the velocity of the RG-59. It is pretty easy to figure, a 1/4 wavelength at 7.050 (234/7.050) = 33.19′ times 66 percent equal 21.9. I had RG-59 with the polyprolene dialectric therefore the length turned out to be approximately 22 Feet. Since I had the Budwig HQ-1 with the SO-239 moulded in the unit, I put PL-259s on each end of the matching coax and then used a barrow splicer to put the regular 52ohm coax feedline to the antenna.. A little weather proofing and this setup has worked well for many years. Results: Actually, the antenna played better than anything that I have had previously. The SWR was flat from 7.0 to 7.1 only rising to 1.5 at 7.3. This was perfect because I wanted it to play RTTY and CW… I did find that the antenna appeared to be less effective broadside, to the North. Stations in New England were difficult to get, however, the Europeans and Western USA were answering on the first call. Also, a few days after the contest, I talked to K4HXW/Mr Tucker, he indicated that he thought the antenna was playing much better than the inverted Vee that I had previously. Added 17 Oct 2011: Been living in Alabama since 2005 and installed the Delta Loop with the apex at 65′ and the bottom slightly kicked out a bit (not more than 5 degrees). I also changed back to the feed point to 12′ from one of the bottom corners. I really have not been able to see any difference in it performace based on changing the feedpoint. It has worked marvelously both for DX and Domestic contacts. I truly think that it is the best single wire antenna I have ever had on 40m. 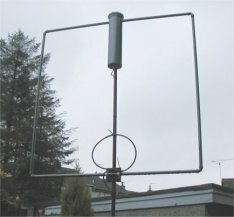 I am probably going to put one up for 80m when the WX permits. I was trying to increase the overall performance of the J-pole, in this design.Â The diagram provided is a more simplified version of the one I did.Â These are a few of the modifications I came up with.Â I added a cap on the top end of the PVC.Â Mounted a so-239 to a split piece of copper tubing, that took the place of the #14 copper wire.Â And, I also added a short aluminum mast that fit into the lower end of the PVC.Â Â I mounted the antenna to a 10′ antenna mast and a small tripod on the roof.Â I tried to add some type of a ground plain but everything I did made the antenna perform poorly.Â After all my efforts the end result was an antenna that out performs the 1/2-wave colinear copper version, with only one exception.Â The working model is somewhat narrow banded and still requires more experimentation.Â Some of the elements must be a little long. of the 50-ohms I get on the higher bands. an impedance of approximately 2X the input impedance, and this was close. It all starts with my friend Leon, K5BUL. Well, he’s a new ham of about 3 years who lives in Aberdeen, MS. He got into ham radio because he wanted to use it as part of cruising on his 35â€™ Fantasia sailboat. His life took a different turn after he bought a new â€™99 Goldwing motorcycle. Heâ€™s now a biker. He has even mounted a screwdriver antenna to his bike and has worked HF using his ICOM 706MKIIG on the motorcycle. Iâ€™ve myself have been a ham since the mid-70â€™s (â€™75 I think) with the original call of WA4UBD, which I kept until a couple of years ago when I got the vanity call K9FV. Iâ€™ve used ham radio on my sailboat for years. In â€™99 when the XYL and I took an extended honeymoon for 6 months to the Bahamian Islands, ham radio stood us in good stead. We had been in the Islands only a few weeks when Hurricane Dennis decided to visit. We found a protected place and rode out the hurricane. The first night out after Dennis, we headed out of the cove. We decided we wanted some something good for supper so we dove for lobsters. What was most unfortunate, however, is that while I was cleaning lobster, my XYL took a shower, slipped, and broke her pelvic bone! The next morning as the Intercoastal Waterway Net came on I reported my emergency traffic. Dr Jim of Miami came on the air and discussed my wife’s symptoms with me. We agreed that it did in fact sound like a broken bone, and she would surely need more medical attention. Needless to say, we needed more medical support than the island could provide. Another ham got on the air and did a phone patch, we were still anchored out, to my insurance company and to DAN (Divers Alert Network). I then upped anchor to the closest marina where we could access the island’s nurse and a pay phone. DANâ€™s staff doctor talked to the local nurse at the island, then the DAN doctor talked to my insurance company. The insurance company authorized a Lear jet ambulance to transport us to Fort Lauderdale for medical treatment. Since that fateful experience, my XLY does not complain about any radio purchases I make. These days I just say â€œItâ€™s for safety on the boatâ€. She even bothered getting her Technician license â€“ KG4TIN. From time to time, I also install a screwdriver antenna on my motorcycle. It’s an old â€™92 goldwing and it works just fine for HF mobile. 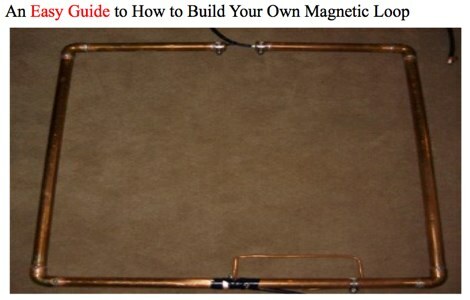 Let’s get back to the topic of Magnetic Loops. Leon and I both share an enjoyment for building things, and antennas are certainly included. Since I live on a 40â€™ sailboat, and he has the land for antennas â€“ we do most of our antenna work at his QTH. After reading Brainâ€™s post (W2BRI) on QRZ and eham.net, I visited his webpage and liked what I read. I spoke to Leon and sold him on the idea of a magnetic antenna before Christmas of 2002. By Christmas Leon had the basic loop built using electrical 3 inch aluminum conduit. This is a fairly heavy walled soft aluminum pipe that bends easy. Leon constructed the loop using â€œfactory 90â€™s.â€ These are pre threaded pipe which is bent into a 90 degree pieces. The loop is a 10 foot by 10 foot square with a 3 inch gap at the top of one side â€“ like we saw in Brian’s antenna plans on this site. Leon and I got the Magnetic loop tuned and tested Dec 30th, 2002. Leon had the loop all made up and ready to be completed when I got there on Monday morning. We hung the 10 ft square loop from a tree limb putting the bottom about three feet off the ground. We added the feed and the capacitor and got the loop tuned up to forty meters. We turned on the radio, and got ready to do our on the air comparison. 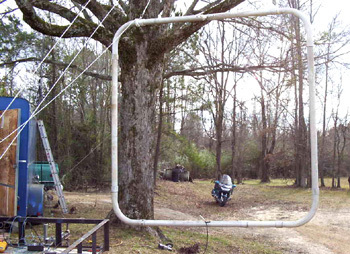 We were located just north of Columbus, MS. We were able to test the antenna with a station in Talladega, Alabama against Leon’s permanent forty meter full wave loop at 30 feet. The gentleman in Talladega was located about 200 miles ESE of our location. WA4FMR near Knoxsville, TN was our second contact, who was located perhaps 400 miles NE of us. Both stations gave good reports on the magnetic loop, but did say the full wave 40 meter loop was better by about 1 or 2 S units. That was about the same results we saw on the S-meter when receiving the two test stations. This performance confirms what Brian had expressed to me earlier on the phone. The one major advantage with the loop however, is its small size. Leon liked the loop so much, he is now planning a 20 meter version. He hopes to compare it to his 20 meter bazooka one day. 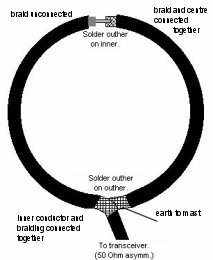 Assembly first starts with the capacitor and motor, this is the important part of the magnetic loop. Get the strip of paxolin and mount the capacitor at one end (top). Fit the insulated coupling to the capacitor shaft and then fit the reduction gear. The brackets will need to be made from 4mm aluminium. Then make up a bracket for the 2 micro switches. 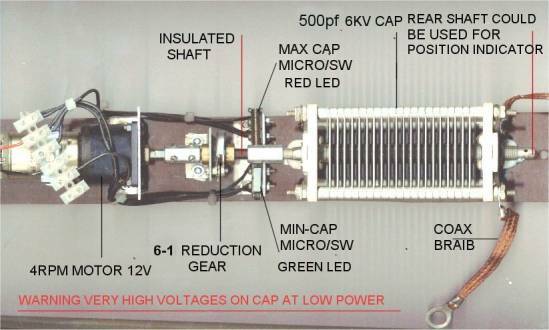 They have to be set as to use the flexible coupling with a long 4mm screw in one of the holes for switching at min/max capacitance, see photo and wiring diagram. Next the 100mm /300mm plastic drain pipe (length to suit cap/motor) fits the bottom section of top plug with pvc. Glue and drill 2* 25 mm + holes 30mm down from top of pipe with the holes opposite one another for the 25mm copper pipe to be inserted in about 25mm. 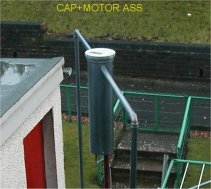 Then bolt cap/motor assembly into pipe. Connect capacitor to copper pipe with coax braiding and 6nmm brass bolts. Get the bottom plug fit the 25 mm coupling and the din socket connect to motor and fit with self-tapping screws and sealant on main pipe. Assembly of capacitor is now complete. Fit broom handle to coupling, I use this as the mast, also to attach the coupling loop with cable ties. 4*1.5 mtrs 22mm copper pipe. Take 1 length cut 30mm of the length the pipet in half — this is the top portion ofÂ the loop. Clean the pipe and bends with wire wool and add flux. Then fit bends to pipe. Do this on flat surface and fix bends with self-tapping screws till you solder. You now have a square loop. Paint if required. Coupling loop should be about a 1/5th size of main loop made from RG58U COAX but I always make it bigger. Then trim it by 15mm at each end till you get a 1-1 match (see photo). Then solder And seal with rubber tape. I use small power supply unit you can buy for calculators/portable radios 3/4.5/6/9/12/volt at 1 amp — they are ideal for the small 12V motor. I built mine into a small box with the switches and the LEDs work well. 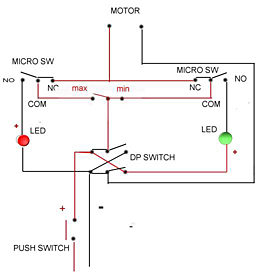 There are more sophisticated control circuits that can be used but this was the easiest.